Ai Quattro Angeli Distance to the centre of town 1.5 km price per day from €34 Located 700 metres from Prague’s historic town square, this apart-hotel offers fully furnished apartments with free internet. It features an ancient, vaulted breakfast room in the cellar. Each bright and parquet-floored apartment is accessed by a private entrance. Ai Quattro Angeli’s apartments feature a full kitchen and a dining area. At the Residence Ai Quattro Angeli, a daily buffet breakfast is served in the vaulted cellar with brick walls. Apartment-Národní 17 Distance to the centre of town 1.6 km price per day from €37 Located in the historic centre of Prague, Apartment-Národní 17 is only 600 metres away from Old Town Square. Czech National Theatre can be reached within 200 metres. The Vltava river with its famous Charles Bridge is 650 metres away. 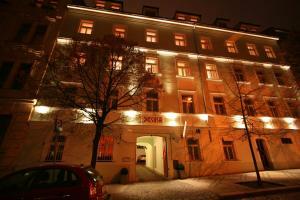 Wenceslas Square is reachable within 500 metres, and Josefov, the Jewish Quarter, is 700 metres away. The nearest metro and tram station Národní Třída is only 100 metres from Apartment-Národní 17. City Partner Hotel Atos Distance to the centre of town 2.4 km price per day from €29 Hotel Atos is centrally located in the picturesque Lesser Town, next to the lush green Kinsky gardens, just a 10-minute walk from Prague Castle, the National Theatre and Wenceslas Square. Housed in a charmingly restored historical building dating back to the second half of the 19th century, the City Partner Hotel Atos offers you spacious, quiet and modernly furnished rooms. Guests can borrow a laptop computer at the reception. Jurys Inn Prague Distance to the centre of town 1.8 km price per day from €50 Located opposite the Florenc metro station, Jurys Inn is a 20-minute walk from Prague’s Old Town Square and 5 minutes by metro from Wenceslas Square. It offers free WiFi, an on-site gym and bike rental. The spacious and modern soundproof rooms at Jurys Inn Prague include a flat-screen TV with satellite channels, a work desk and complimentary tea and coffee. Snacks, pastries and coffee to go are available at the all-day coffee bar. Vila Josefina Distance to the centre of town 5.5 km price per day from €37 Located in quiet residential area 2 km from Prague Castle, Vila Josefina offers free in-room Wi-Fi and free private parking. Veleslavin Underground Station is 500 metres away. All rooms at Vila Josefina feature a seating area, satellite TV, and a bathroom with hairdryer. Guests can use a shared kitchen. The garden includes a children’s playground. 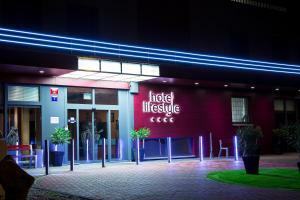 A spa centre with a swimming pool and fitness room is 300 metres away, and tennis courts are within 500 metres. 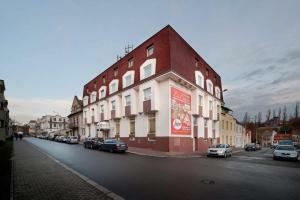 Hotel Henrietta Distance to the centre of town 5.4 km price per day from €21 The Hotel Henrietta is located in a quiet residential area of Prague, 200 metres from the Kobylisy metro station. It offers a garage and free Wi-Fi. Parking on the street is free. 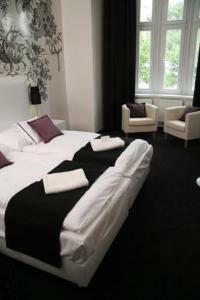 All rooms in the Henrietta hotel have an en-suite bathroom and a satellite TV. Prague's Old Town can be reached within 10 minutes by metro. The Pražské Výstaviště Exhibition Centre, the Letnany Fairgrounds and Holesovice Train Station are about 3 km away. My Hotel Apollon Distance to the centre of town 3.3 km price per day from €22 The renovated, stylish My Hotel Apollon in Prague's Zizkov district is a 15-minute tram ride from the centre. 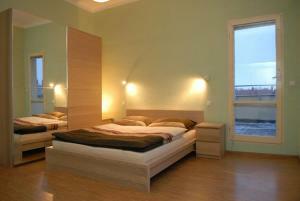 It offers air-conditioned rooms with free W-Fi and plasma TVs. The rooms are spacious and some of them even feature a balcony. A rich buffet breakfast is available in the morning. Close-by there is the green Vitkov Hill, which is one of Prague's largest parks. The Vozovna Zizkov stop for day and night trams is located right opposite the My Hotel Apollon. Budget Apartment Distance to the centre of town 1.2 km price per day from €15 Prague’s Budget Apartment is just 3 km from Riegrovy Sady Park and the Vitkov Monument. Many shops and restaurants are in the area and Wenceslaw Square is 4 km away. These spacious rooms have modern furnishings and large windows that flood the units with a lot of natural light. A communal kitchen and laundry facilities are also available for use on site. Wi-Fi is available free of charge. The Olšanské nám tram stop and the Jiřího z Poděbrad metro station can be reached on foot in 10 minutes or less. Pension U Lilie Distance to the centre of town 1.9 km price per day from €55 The Pension U Lilie is a family-owned guest house in the Old Town of Prague, only a few metres away from the Charles' Bridge and the Royal Route. Free Wi-Fi is available throughout the property. All rooms of U Lilie Guest House feature a private bathroom, satellite TV and a fridge. Internet terminal is available on the second floor and is free of charge. You can also find a restaurant on site specializing in Italian and Czech cuisine, where you enjoy a 10% discount on wine and food. Hotel Lifestyle Distance to the centre of town 8.3 km price per day from €39 The modern Hotel Lifestyle is located next to the Asian Trade Center Sapa and offers a casino and Asian-style karaoke rooms. The restaurant serves French and Italian specialities. 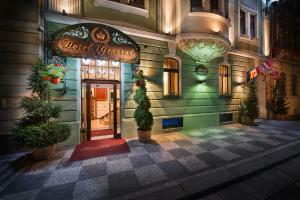 This hotel is located near Prague’s Vietnamese Sapa market, in Prague 4. The nearest bus station is Libusske Sokolovny, just 200 meters away, and the centre of Prague can be reached by public transport in 30 minutes. Each is fitted with a minibar, telephone and electronic safe.